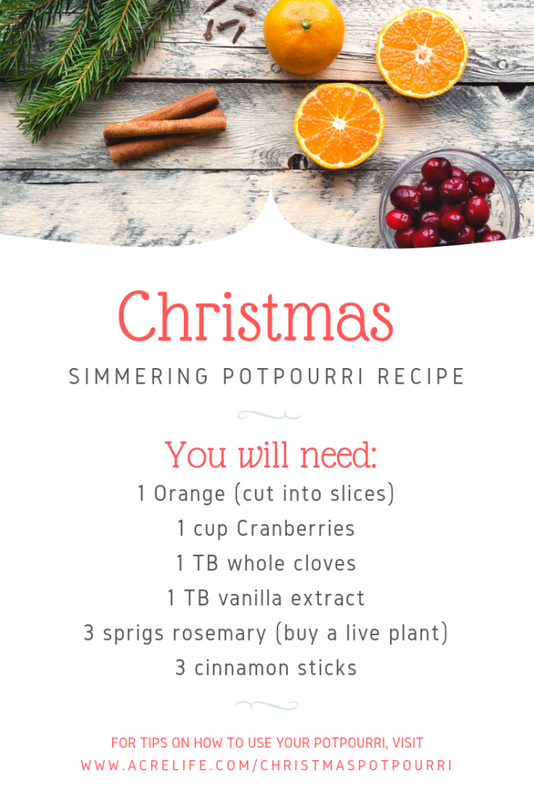 I love this recipe for a simmering pot Christmas potpourri. It fills your house with such an amazing smell that is a perfect mix between sweet and spicy. This is a great recipe to use in your own home and with a little extra work, you can give it away as a Christmas gift to friends and family. You can refrigerate your simmering pot recipe and reuse daily for up to 7 days. Just remember to keep adding water as needed!!! Look for rosemary plants at your local grocery store or hardware store. They look like mini Christmas trees! If you can’t find fresh cranberries, buy a bag of frozen cranberries. Try a pomegranate if you can’t find ANY cranberries. Use a small Crock Pot if you don’t want to use a pan on the stovetop. I got one of these in a set one year and have never used it until now. If you plan to make this as a gift, buy the cloves and cinnamon sticks in bulk to save money. I have included links to Amazon for your convenience. Package your dried potpourri in Cotton Muslin bags. This makes an amazing gift that your friends and family will love! However, to give this away, the ingredients have to be dried so that they can be packaged. I plan to use my Harvest Right Home Freeze Dryer, but you can also dry the ingredients in the oven. I will have more on the drying process soon. The smells of Christmas bring back so many memories for me. I remember the smell of our live Christmas tree when I was young. I really miss having my house smell like a Christmas tree, however, I don’t miss all of the needles scattered across the floor. Find out how I have achieved the best of both worlds by making a DIY Diffuser Christmas Ornament. I also love diffusing essential oils during Christmas time because there are so many combinations that I can create. The benefit of diffusing essential oils is that they provide a wide range of health and wellness benefits. Check out some of my favorite essential oil Christmas diffuser recipes.